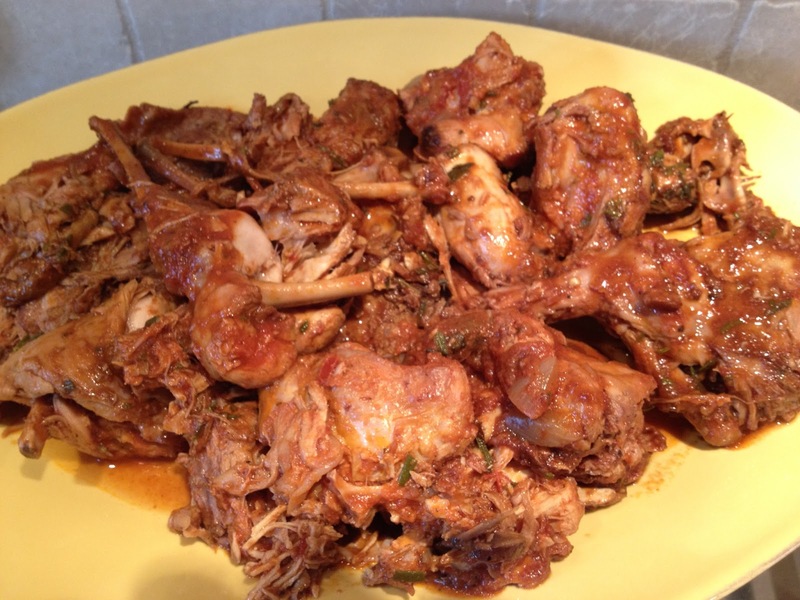 For some time my son had been begging me to make Coniglio Brasato, or braised rabbit. This is a classic Tuscan dish and is so simple to prepare. What follows is mostly a photo essay at each stage of the preparation. Look away now if you risk hunger! 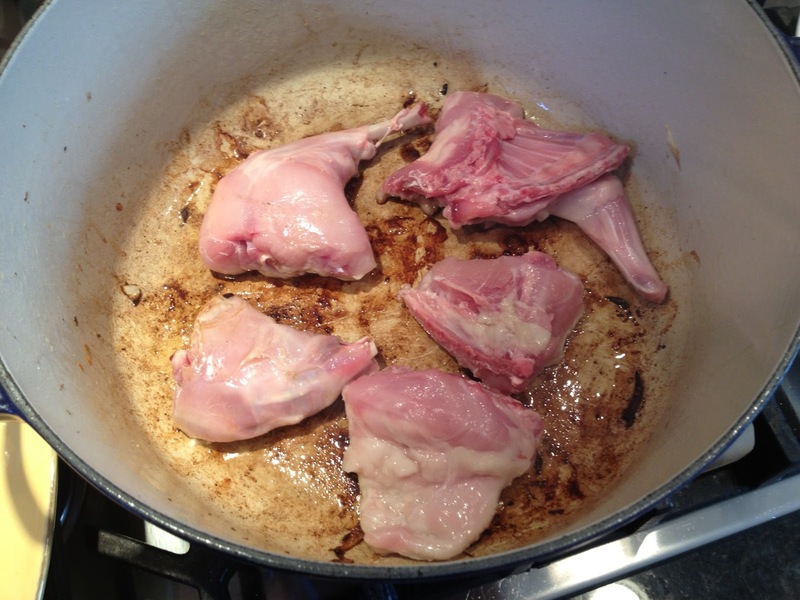 Start by patting dry the rabbit pieces and browning the meat. Work in batches and don’t crowd the pan. Take time to get some nice color on the meat. Season with salt and pepper as you brown the pieces. 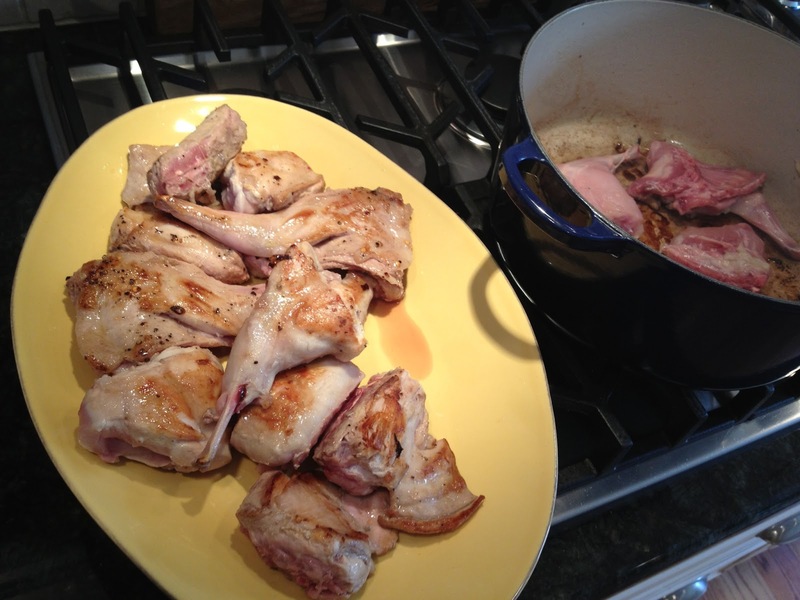 Once you’re done browning the meat, set them aside and start the base of your braise. Toss in the chopped onion, garlic, salt and pepper and saute. 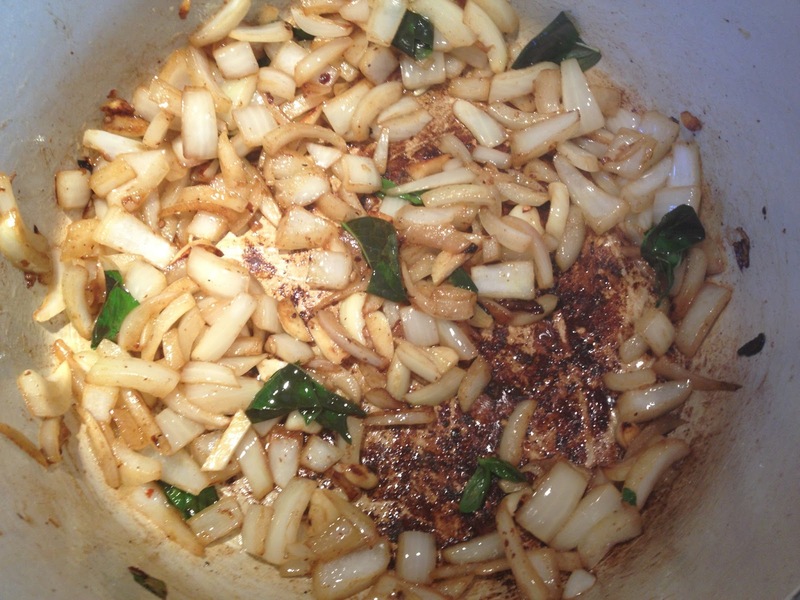 The onions will start to pick up some color off the bottom of the pan. Take time to let them soften. Add your basil leaves in for a minute or so just before deglazing. Deglaze the pan with about a 1/4 cup of red wine and be sure to scrape up all the brown bits and pieces on the bottom. That is intensely flavorful. 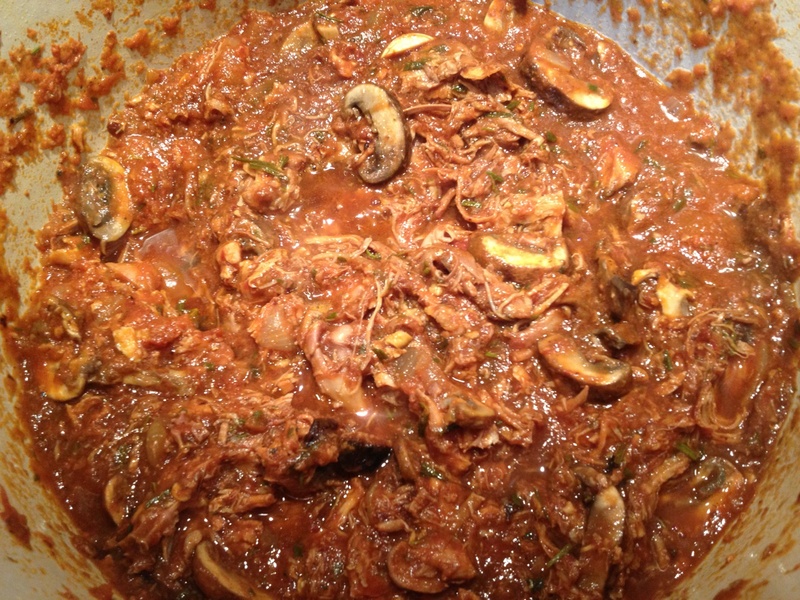 When that’s done, simmer to burn off the alcohol, add the San Marzano Passata, the chopped rosemary and the mushrooms. Return the rabbit pieces to the pot, add another 1/4 cup of red wine, cover and simmer on low for 4-5 hours or until the rabbit is fork tender. Once it starts falling off the bone, you’re done. Not all pieces will fall apart – I wanted the legs and thighs to stay whole this time. As I mentioned, some of the rabbit meat falls off, some doesnt. 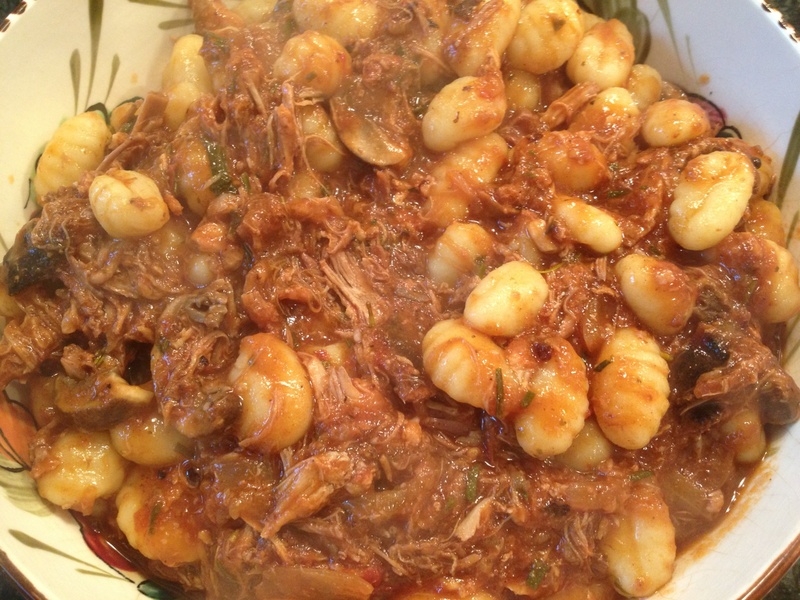 What’s left in the pot is an amazingly flavorful rabbit ragu that would be amazing on pasta or in this case, gnocchi! I used two packages of potato gnocchi. Cook according to the package instructions and drain into the pot with the ragu. This alone could be an entree. This was a huge hit, even among those with slight trepidation about rabbit. The best part is, there are plenty of leftovers and when pairing a red wine with this meal, you can’t really go wrong. We chose a 2007 Brunello that I will review later this week. However, I can’t think of a Tuscan red that wouldn’t go well with this dish: Chianti Classico, Brunello, Rosso di Montalcino, Vino Nobile, Carmignano, take your pick! Aaaah, Coneglio – sooo sweet and tasy! 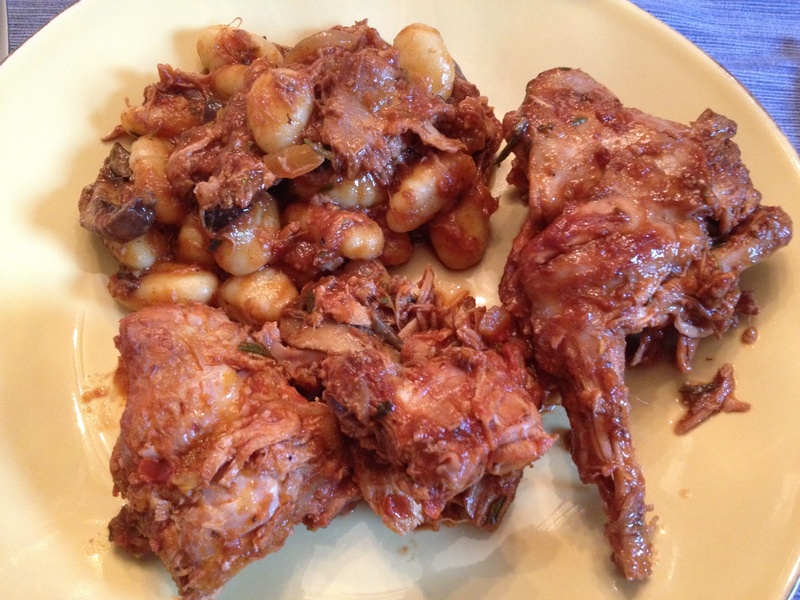 I had it a couple of times this summer in Liguria and hearthy Rossese did go very well with the tender rabbit meat. 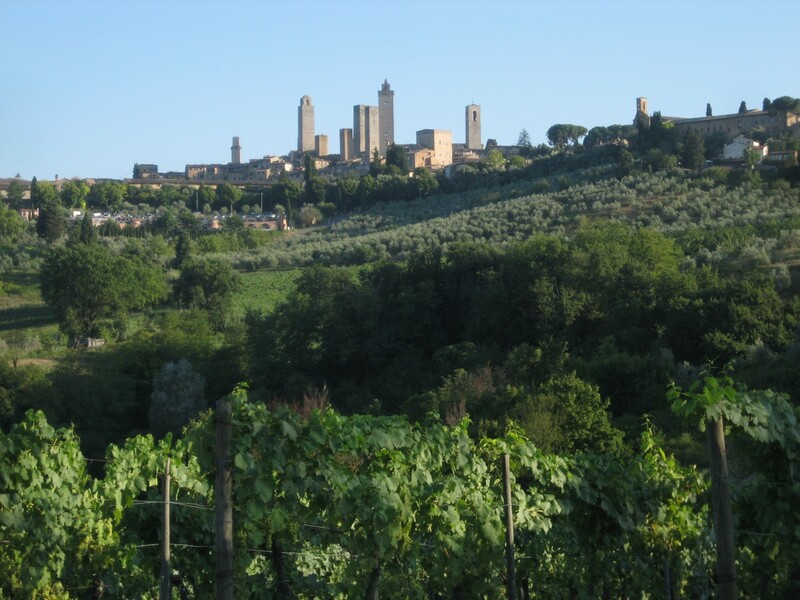 And speaking of Brunello Joakim, was I right about your older mystery bottles? I'll have to see..
John: "Listening to U-R son was a great idea!" Thanks Vinogirl – let me know if you try it!